The Madpackers have made their way down to Pushkar, bringing their famous Delhi shenanigans along. Stay with us if you enjoy a healthy dose of traditional art, breathtaking views and unplanned adventures. You get to choose from our massive dorms and private rooms spread across 4 floors. Our 3 terraces are divided into a lounge area, rooftop cafe and a yoga/camping terrace. Breakfast, as always, is free and limitless. So is the fun. I stayed at Madpackers Pushkar for two days to celebrate Holi. I must say a lifetime experience! Got to meet so many people from across the world and different walks of life. The atmosphere during Holi season was so lively! The hospitality of the staff was an icing on the cake. Nikhil and Kirti - the best hosts! They just didn't have a "No" for anything we asked them and went an extra mile to make sure our stay is enjoyable and worthy. Thanks Madpackers! Amazing hospitality, amazing food, amazing people.. Overall a great stay! Best hostel I ever stayed. Look no further. 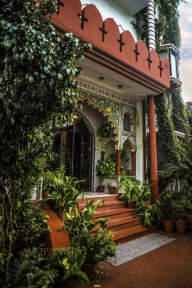 My partner and I have been coming to India for 9 years and this is the most beautiful hostel/hotel we've stayed in. 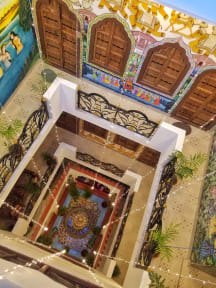 The staff is super friendly and helpful, the rooms are big, clean and comfortable, there's an attention to detail in this place that we haven't quite seen anywhere else that makes staying there an experience in itself. If you're looking for a place to stay in Pushkar that feel like a boutique hotel but at an affordable price, we'd strongly recommend Madpackers! Nice place and staff! It is strategically located in a quiet area in Pushkar, away from the crazyness of the market that surrounds the lake. It had a great hot shower and nice facilities. The only thing it was missing is more comfortable areas to sit and just hang around inside! Recommended! This hostel was beautiful. The wall paintings, the plants everywhere. I did find it lacked a ‘common’ area where you could meet others. I also noticed I was the only non-Indian there. In the mixed form I was in, I was with two other guys. Maybe it was due to it being post Holi why there weren’t any foreigners there when I was there but for that reason I checked out and didn’t stay. I think all foreign backpackers stay in the town centre.